Before you begin, check your local codes and be sure to comply with the Americans with Disability Act (ADA). 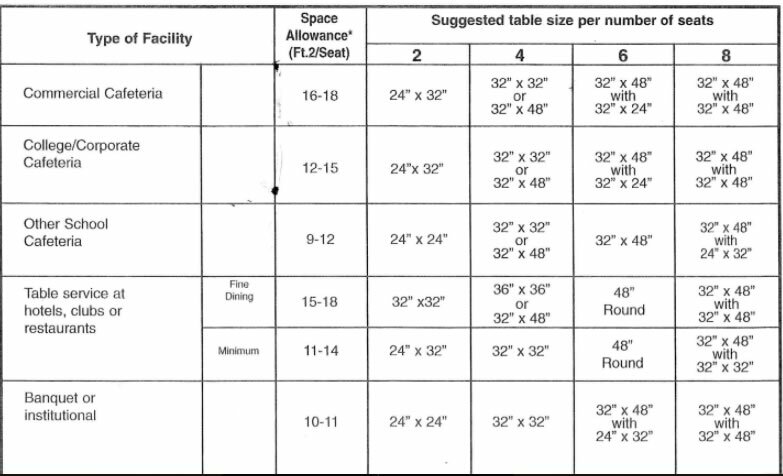 Take the square footage of your area and divide by the space allowance per seat to determine potential capacity. Deuce seating and wall spacing maximize the most space, although diagonal seating also saves floor space. Allow 18″ per seat from edge of table to back of chair. Allow 48″ between squared tables with chairs back-to-back; leaves 12″ to push out. Allow 24″ between corners of diagonal tables for customer access with no aisle. Allow 30″ between corners of diagonal tables for customer access with a narrow aisle. 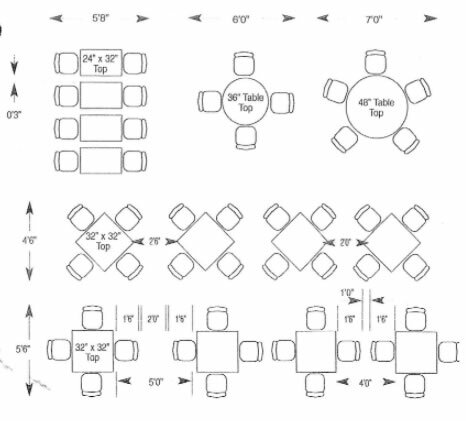 Allow 60″ between squared tables with chairs back-to-back for a 24″ service aisle. Note: the ADA requires a 36″ clearance for aisle for dining areas; 5% of the total dining space should be accessible to wheelchair users.